San Diego is a great place to visit for many reasons, and its history is one of them. It all began with the Kumeyaay, the indigenous people who hunted and harvested around the protected bay and surrounding hills. Then came Spanish explorers who, venturing up the coast in 1542, came upon the protected bay to become the first Europeans to step foot on the West Coast. Pressed by the colonization attempts by other countries, Spain claimed the entire region in 1769. This led to the establishment of the first mission and first presidio (fort) on the west coast in what is now Old Town San Diego. This first mission was established by none other than Junipero Serra, the Franciscan friar who was canonized by Pope Francis during his recent visit to Washington DC. After Mexico gained its independence from Spain in 1821, Mexican families settled in the San Diego area, prospering by raising cattle on huge inland ranches. Following the ceding of California by Spain to the U.S. in 1848 at the conclusion of the 2-year Mexican-American War, Americans joined the established and thriving Mexican community. Right on the heels of these changes came the 1849 Gold Rush. Although San Francisco was the epicenter of gold fever, San Diego felt the impact of prospectors and gamblers traveling through it from the south, and gold was discovered in the San Diego County hills in 1869. Throughout San Diego, there are pieces of these fascinating historical influences, making it a great place to experience a unique aspect of America’s history. Time travel through San Diego’s fascinating history and see all the sights on an Old Town Trolley Tour. The 2-hour narrated tour covers a lot of history and important sights. 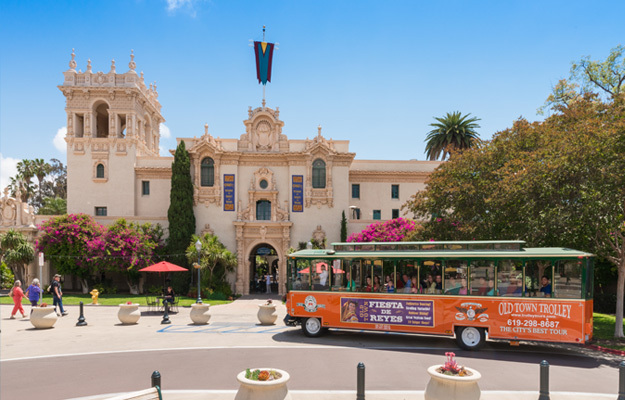 San Diego’s historic places are not all concentrated in one area, and the 25 mile trolley tour takes you to all the must see places: through Old Town, along the Embarcadero, through the Historic Gaslamp Quarter, over to Coronado and out to Balboa Park. Start your trip at any one of the 11 convenient stops and experience one of the best tours in the city. Kick back and stay on for a whole loop to see everything the entertaining conductors point out about the city. Or, enjoy the tour in segments by hopping off at one or more of the stops on the loop to explore the unique piece of San Diego surrounding a particular stop. Trolleys come and go from each stop – approximately every 30 minutes – so when you’re ready, hop on the next available trolley that comes by. To make the best of your tour, plan ahead. Keep in mind that the number of stops you can explore in one day depends on the time of year and the amount of time you have on the day of the tour. If you start out late in the day, you might want to consider a two-day pass. For the early Spanish exploration period and more, take a road-trip out to the 160 acre Cabrillo National Monument on Point Loma. The monument overlooks the area where, in 1542, Juan Rodriquez Cabrillo stepped ashore as the first European on the west coast of the U.S. All around are absolutely breathtaking views of the Pacific and San Diego. 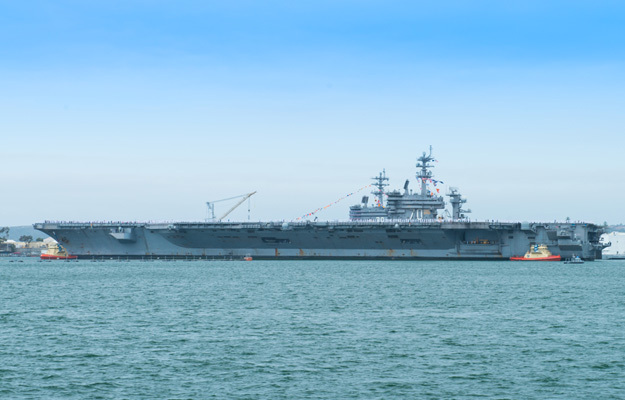 From this great vantage point, you’ll see ships coming in and out of the harbor, Navy jets taking off from Coronado Naval Airfield and, if you’re lucky, between December and February you may even spot gray whales passing through on their annual migration! Visit the nearby Old Point Loma Lighthouse, one of the original eight lighthouses built on the West Coast, which was restored to reflect what it was in the 1800s. Check out the interactive exhibits in the Keepers Quarters, see a small exhibit on WWII coastal defense batteries and hike down the 2-mile Bayside Trail through the last remnants of coastal sage scrub habitat in the world. Or, take the steeper and more challenging Coastal Trail down to the Tidepools. Views along the way are breathtaking! 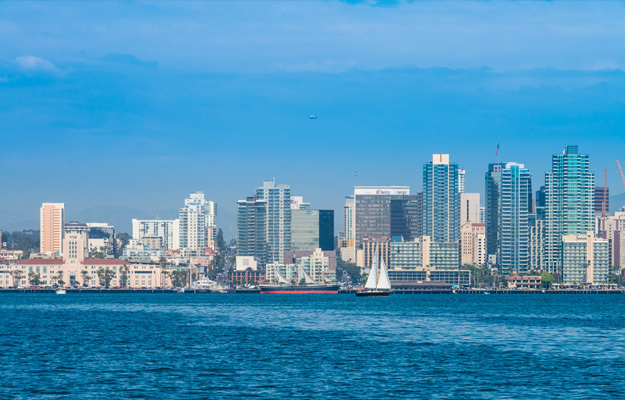 To really get into the maritime history of San Diego, which continues today with the presence of the U.S. Navy everywhere, walk along the Embarcadero to see the world’s finest collections of historic ships in the Maritime Museum. These are real vessels, some of which can be boarded and explored; others viewed at a distance. The newest, San Salvador, is a replica of the one Juan Cabrillo commanded when he discovered the bay in 1542. The Star of India circumnavigated the globe under sail multiple times. Steam Ferry Berkeley rescued thousands during the 1906 San Francisco earthquake. The Maritime Museum exhibits tell stories of these vessels as well as the commercial fishing industry and the U.S. Navy presence throughout the years. Visiting during the week? Head out on the bay on a 1914 Harbor Pilot boat for a History of the Bay tour. On weekends, go out on a Vietnam- era Swift Boat, covering military history of San Diego Bay, or on Tall Ship California. The U.S.S. Midway Museum is an incredible experience. Astoundingly huge, it is literally a floating city to explore. The self-guided audio tour will guide you through it, and friendly docents are on hand to explain things too. Lined up on the massive expanse of flight deck are restored aircrafts. A total of 29 are onboard! Venture below-deck to see how sailors and marines lived on the longest-serving Navy aircraft carrier of the 20th century which saw extensive action in Vietnam and the first Persian Gulf War. See the crew’s sleeping quarters, the massive galley, engine room, machine shops, the ship’s jail, the bridge high over the flight deck and more! After Mexico won independence from Spain in 1821, the hillside location of what is now called Old Town San Diego State Park became the center of local life. Today, the park preserves and recreates the original Spanish settlement from 1821 until the American period in 1848. While the State Park area today has souvenir shops and restaurants, there are old houses to check out too. For example, the Casa de Estudillo (1827) made of adobe, represents the early settlers of Mexican California; so does Casa Bandini. A gift and craft market was built on the footprint of the original 1829 U-shaped house. The surrounding Old Town community has streets lined with shops, a unique marketplace, restaurants and older buildings, making it a pleasant place for a stroll. Above Old Town on Presidio Hill are interesting sites pre-dating the old settlement. The San Diego Presidio was a military fortification built by the Spaniards in 1769 as the first of the many presidios they built along the coast. Nearby is Junipero Serra Museum where thousands of artifacts unearthed from the site of the original Mission San Diego de Alcala, established by Father Junipero Serrain 1769, as the first mission and European settlement on the west coast, are on exhibit. Also on the hill is a fully restored duplicate of the original Mission San Diego de Alcala. In light of Junipero Serra’s recent elevation to sainthood, the site will become a San Diego must see, as will the original Mission San Diego de Alcala which was moved inland in 1774 and still stands today as an active church. Located just beyond Old Town, the Mormon Battalion Museum is a gem. It’s a well-done interactive experience which tells the unusual and compelling story of the times and trials of the epic 2000 mile march from Missouri to San Diego of a U.S. Army all-Mormon Military Unit during the Mexican War. The arduous, dangerous trek, as well as the unit’s work of building roads, digging wells, and constructing buildings in the frontier southwest, is experienced through friendly storyteller guides, automation, videos and audience participation. It’s a wonderful place for families; kids love it because they get to experience the crossing of the vastness of America as pioneers! Young visitors can be chosen to take part in the trail campfire re-enactment or dress up as a participants in the difficult crossing. All kids can pan for gold during the gold rush! The cool thing is the way the museum puts all the pieces together through engaging displays in several rooms which explain a different time in history to make a little-known time in California and the Southwest history in 1846 come alive. While every now and then a religious reference is made, it’s all about history, and it’s really well done. Spend an entire day in the beautiful 1600-acre Balboa Park. This is where many of the architecturally significant buildings housing the 15 major museums and performing arts venues were built to host the 1915-1916 Panama-California Exposition commemorating the opening of the Panama Canal. This was an era in American history when all was grand and ornate, and these highly ornamented Spanish Renaissance buildings exemplify that time. Additional buildings and landscaping were added for the 1935-1936 California Pacific International Exposition, which was held to boost the economy during the depression. The architecture was Southwest design, from Aztec and Mexican pueblo to Art Deco and Art Moderne. The list of museums and art institutions housed in this cluster of stunning buildings surrounded by lovely landscaping is equally astounding. Plan what you want to see from choices that include San Diego Museum of Man, San Diego Museum of Art, San Diego Arts Institute, Natural History Museum, Reuben H. Fleet Science Center, Timken Museum of Art and more! Here’s a fun way to experience the Historic Gaslight Quarter – go on a Brothels, Bites, and Booze Walking Tour. It’s a great way to wander through the quarter that in the late 1800s was a booming waterfront commercial district. The Stingaree area at one time had 120 bordellos and 71 saloons! Life was fast, furious and speculative. Along the way are great restaurants for food tastings and delicious cocktails. You’ll hear great stories about the seamy, wild-west side of San Diego history and see places that once housed brothels and opium dens. It’s a new and tasty sightseeing twist, and a great way to get to know some of San Diego’s restaurants and meet and socialize with perfect strangers. It’s a fun night out! Another fun way to spend an evening in San Diego is by experiencing yet another side of the city – the paranormal side. With so many layers of turbulent history filled with risk, tragedy, loss and lives lived on the dark side, ghosts and spirits surely appear throughout Old Town at night. Experience it on a Ghosts & Gravestones Tour that includes entry into a house reported to have the most documented incidents of paranormal activity in America, the Whaley House. 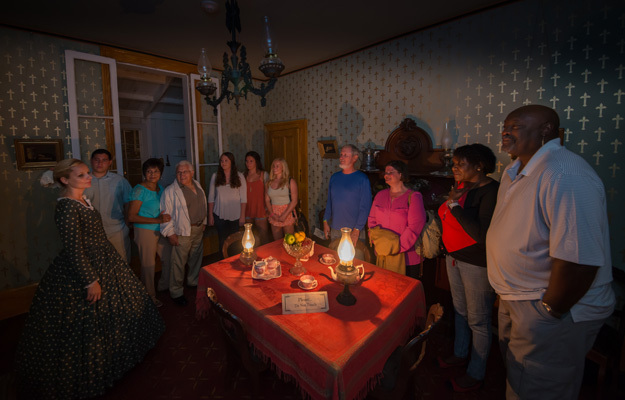 Hear tales of nighttime happenings in Pioneer Park, walk among the gravestones in El Campo Santo Cemetery and, if you dare, venture inside the haunted Whaley House.